Food Writer’s Diary has a new home at NRN.com. 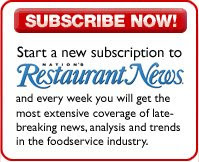 Please visit it, so that your page views can be added to those of Nation’s Restaurant News’ other readers, helping us to impress our bosses with our awesomeness. If you like RSS feeds, you can get Food Writer’s Diary’s here. I’ll keep cross-posting here for awhile, and of course my 18 gajillion previous blog entries will stay here. But I think you’ll like this blog’s new home. And while you’re there, you might want to click around and see what else is on offer at NRN.com. I think you’ll particularly like the Food and Beverage section, which has all sorts of information on the latest trends and a whole lot of stories written by yours truly. While I’m doing this shameless self-promotion, I might as well also point you to our Cool Plates feature, which showcases menu items that catch my eye and that I hope will inspire chefs’ creativity. Beard Awards: press room or audience? Well, it could be argued that I should hang up my hat as James Beard Foundation Chef and Restaurant Award predictor. Of the 19 categories that I predicted two months ago, I got four of them right: I predicted that Per Se would win for outstanding service, that Eleven Madison Park would win for outstanding restaurant, that Michael Solomonov would win for best chef in the Mid-Atlantic and that Tony Maws would win for best chef in the northeast. I got everything else wrong. But that’s all right. The awards were interesting. Portland, Ore., picked up two awards — for Gabriel Rucker of Le Pigeon, who won Rising Star Chef of the Year, which goes to a promising chef aged 30 years or younger; and for Andy Ricker of Pok Pok, who won for best chef in the Northwest. For best chef in New York, Gabrielle Hamilton beat out Michael Anthony, April Bloomfield, Wylie Dufresne and Michael White. Cynics would say that she won because she wrote a book, an argument that would have added weight because the winner for best chef in the Southeast, Andrea Reusing of Lantern in Chapel Hill, N.C., also recently had a book published. We also saw what I think was the first tie in a chef and restaurant award, between Saipin Chutima of Lotus of Siam in Las Vegas and Tyson Cole of Uchi in Austin, Texas. I was told that Cole was less than gracious about being part of a tie, but I wouldn't know, because I decided to spend the awards in the press room. I had a ticket to be part of the audience, and I was told I’d have to choose where to go. I could either sit in the audience for more than three hours while awards were handed out and speeches were made, or I could be in the press room, eating meatballs and cheese and drinking cocktails and Champagne and coffee and talking with my fellow food writers while the awards played on monitors in the rooms. It didn’t used to be like that. These were my 13th Beard Awards, and I remember when you used to be able to move back and forth between theater and press room whenever you liked, watching the ceremony, running back to the press room to interview chefs, running back to the ceremony. Ultimately I settled for watching the proceedings from the press room, but over the years that room has taken on a life of its own. It used to be that only about a couple dozen members of the press cared about the Beard Awards — maybe fewer. The press room was a tranquil place. The video feed broke sometimes, or they'd forget to show us the videos of the humanitarian award winner or the who's who inductees, but it wasn't that big a deal. Now the press room has maybe a hundred people at its most crowded moments, some socializing, some live-tweeting, many asking me who just won as I scampered back to the press room's entryway, where the loudspeakers were located so I could actually hear the results of the awards over the din of the crowd. It’s a fun party, but the Beard Awards could be on another planet. And now that the Beard Foundation is live-tweeting the results, we don't really need to be there at all. Still, should I be hanging out with the collegial group of people in the press room, ranging from reporters from Reuters and the Wall Street Journal to representatives from web sites like Eatocracy and Eater and blogs I’ve never heard of, or should I be sitting in the audience and reporting on the Zeitgeist of the ceremony, getting a grasp on what the leaders of the Fine Dining world are thinking about and understanding with my own eyes and ears how Tyson Cole behaved? A bunch of people don't go to the awards at all, but show up at the afterparties, of which there are many. After the awards and the reception that followed it, I started across the street from Lincoln Center, where Daniel Boulud's Bar Boulud has new neighbors, Boulud Sud and Epicerie Boulud, which hosted a raucous celebration for which Boulud opened a Balthazar — that's 12 liters — of 1998 Bordeaux. There I ran into my friend Jennifer Watson, a devoted customer of Daniel’s, but also a devoted customer of The Modern, whose wine director Belinda Chang won the award for Outstanding Wine Service. So we went there next and drank Champagne while I spoke with the writers, chefs and publicists in town for the festivities. We then took a quick swing by Eleven Madison Park and then on to ABC Kitchen before stopping in The Spotted Pig for a Pimm's Cup and commiserated with the family of Dahlia Narvaez, pastry chef of Osteria Mozza in Los Angeles, who didn’t win the award for best pastry chef. Instead, that award went to Angela Pinkerton of Eleven Madison Park, which also won the award for Outstanding Restaurant. I think conversation got philosophical, and Jennifer wanted a hamburger, but The Spotted Pig's kitchen had closed, and so we ended the evening, as food-oriented evenings often end, at Blue Ribbon, where I spoke with Christopher Hastings, chef of Hot and Hot Fish Club in Birmingham, Ala., who had lost the award for best chef in the South to Stephen Stryjiewski of Cochon in New Orleans, about the merits of setting up a foundation for the Bocuse d’Or. Chris Hastings was with Gavin Kaysen, you see, who quite apart from being chef of Cafe Boulud represented the U.S. in the Bocuse d'Or some years back. But soon Jennifer and I got a table and so instead of continuing the conversation, we had fried chicken. Then we shared a taxi, which dropped me off in the office before taking her home, and then I wrote this blog entry. And now I'm going home, too. What can I say? Chefs are in town for the Beard Awards, last night many of them went to Chelsea Market, some of whose merchants handed out free food, and we ate, drank and were merry. Well, there are a couple more things to say. This year’s Chefs Night Out was much more of a James Beard Foundation-sponsored event than in previous years. As far as I could tell, Bon Appétit has stopped any sponsorship of it, which makes sense since they were holding an event on Saturday in Las Vegas. Instead, Gilt, the Food Network and the Cooking Channel were listed as sponsors, and Gilt threw the afterparty, which was also in Chelsea Market, but a different part. Servers at the various food stations were wearing James Beard Foundation T-shirts with the word “Eat” printed vertically on them — clearly a move at more aggressive branding on the part of the foundation. Good for them, I say. I took some pictures, which are available for your viewing pleasure at nrn.com. Did you know that if you cut your finger at the CIA, it’s an incident? I don't mean the Central Intelligence Agency. Obviously if you cut your finger there it would be an incident. I mean the Culinary Institute of America, where practically everyone is wielding knives, and a lot of them don’t have much experience doing it. I figured I’d just grab a band-aid, apply it to my left index finger and get back to work. But no. I had to sit there with a paper towel wrapped around my finger while a security officer named James came and applied first aid. “Apply pressure and hold the finger over your head to control the bleeding,” an administrator told me. She seemed concerned that I would bleed out. All I had done was bring the knife down hard enough on my left index’s fingernail to break it and draw a little blood. I hadn't severed anything. I’d cut myself worse when I was in culinary school. Since that was in France in the 1980s, my chef-instructor wondered why I had stopped chopping apples. “Because I’m getting blood in them,” I said. Chef Pétrof agreed that I could wash my finger and apply a bandage to it if I wanted to. Which I did and then finished chopping my apples. I think I was making a charlotte aux pommes, but I don’t really remember. It was 1986. Last weekend I was at the CIA's Greystone campus in St. Helena, Calif., for the inaugural Pork Summit. That event replaces the Taste of Elegance, a the finals of a national competition among chefs to make delicious pork dishes. In the past, winners of regional competitions would be flown to the semi-finals for a second round of competition, and then the top eight performers in that contest would have to get back into the kitchen to do it again. 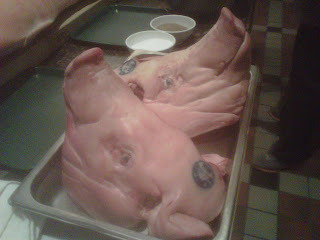 Members of the trade press like me were invited to hang out, meet the chefs and learn more about pork. I guess the National Pork Board decided that it was the hanging out, meeting and learning that was valuable, because they got rid of the national competition. Instead they flew all the regional winners to the Napa Valley for a demonstration on how to butcher half a pig, followed by cooking demonstrations by celebrity chefs. The next day we were all split into teams to butcher and cook half a pig. I’m not sure why they decided to have the journalists cook, too, but hey, I'm a team player. I’m no chef, but I do cook, and I'm good at fetching spices and whatnot. I was happy to be a helper. Our team leader was Philadelphia chef and restaurateur José Garces, who, as you probably know, is also a star of Iron Chef America. He seemed like a good choice for team captain. “Are you comfortable in a kitchen?” he asked everyone on the team, which included several chefs who won regional competitions, but also me and Plate editor Chandra Ram, both of whom had been to culinary school. Michigan-based chef Steven Grostick, who was a butcher before he became a chef, volunteered to handle breaking down the pig half. “I’m a food writer,” I said, and volunteered to fetch things and be a prep cook and slave as they saw fit. So the next day, José handed me lists of spices and ingredients to fetch. He had me put eggs in the immersion circulator and track down a terrine mold for him to put his scrapple in. Compared to what? I thought. Because, you know, they’re better than my 11-year-old nephew’s but I would presume considerably worse than an Iron Chef’s. I shrugged and tried to indicate as much trepidation as I could when I said they were okay. That was good enough for him, and he had me chop mushrooms and julienne onions. It was interesting to watch José manage everyone. He seemed aware of the need to respect the skills of the other chefs, with whom he spoke with great diplomacy but generally left alone, and he also gave me increasingly challenging tasks, as though he were automatically training me. I mean, they didn't get too challenging, but I did graduate from chopping mushrooms and onions to finely chopping parsley and chives. I think that’s a little bit harder. At any rate, it was while I was chopping chives that I managed to smash the fingernail on my right index finger and cause an incident. Seriously, I thought I just needed to wrap the thing up and keep chopping, but James the security guy rubbed it with an antiseptic ointment and applied one of those fingertip band-aids to my finger — really expertly, I might add; it covered everything perfectly. Then he gave me what he called a “finger cot,” a sort of (non-lubricated) condom for my finger, to keep me from bleeding into the chives. I give him a business card so he could spell my name right in the incident report that he’d have to file. I apologized to José for the delay in finishing my chive chopping, grabbed some parsley from the walk-in, washed it off and chopped it up. He had no interest in the fact that I'd chopped up my finger, and I appreciated that. It made me feel like a grown-up. Did you know that a cabal of restaurant CEOs get together several times a year to scheme and plot? Okay, maybe that’s not exactly true. They don’t really plot. They get together and talk about the restaurant businesses and visit restaurants in different cities. And I guess I wouldn’t call them a cabal. “Some guys” is probably more accurate. But I don’t really know. Which Wich chief executive Jeff Sinelli just told me about them. They’re in New York now, and Jeff asked me to join some of them at Soul Daddy, the winner of America’s Next Great Restaurant, for a quick bite. So I went to the South Street Seaport and met Abe Ng, president, CEO and chief sushi officer (so says his business card) of Sushi Maki in Miami, and David Goronkin, who doesn’t have a business card because he’s between jobs. He used to be the boss at Bennigan’s, and on June 1 he starts as CEO of Real Mex Restaurants, which operate the Chevys, El Torito and Acapulco chains. We picked at the food, and then Jeff asked for a manager and quizzed him about the restaurant. I didn't have to do anything. I just sat there and sampled the wild rice salad while Jeff interviewed the guy. It turns out that America’s Next Great Restaurant was filmed last year, and the winner, Jamawn Woods, didn’t know he won until it was announced on Sunday. But in the meantime, Steve Ells and the other investors in this next great restaurant got to work hiring staff and securing real estate and generally making the restaurant happen in three places at once — Los Angeles, New York and Minneapolis. That they kept the restaurant’s identity under wraps all that time is amazing. The manager confirmed that the New York restaurant was packed on its first two days of business. But it was pretty quiet when I met the CEOs there at 5:10 on its third day of business. It was a crappy, rainy day, which might have had something to do with it. The food is supposed to be soul food that's good for you. 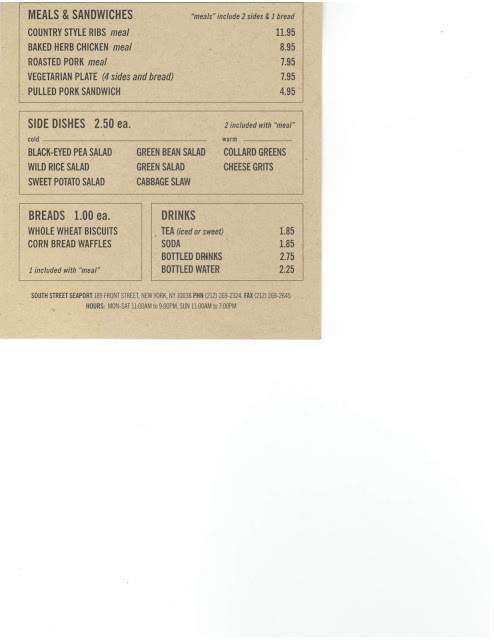 We tried the ribs and the chicken and the pulled pork sandwich, the black-eyed pea salad and the wild rice salad and the sweet potato salad and the cabbage slaw. We had a cornbread waffle and some cheese grits. The manager told us that the menu items were developed based merely on their names, which the investment partners gave to their development team in Denver. And I don’t like to badmouth a place, so I’ll say I liked the waffles and the cheese grits. The rest of it tasted like it was good for you. It would be harsh to say it’s soul food without soul, but, well, I guess I just did. Jeff, Abe and David had dinner plans with Drew Nieporent, who was going to show them Tribeca Grill, Nobu and Centrico, so that was probably fun. I just got off the phone with Rickshaw Dumpling Bar owner Kenny Lao, who’s opening his second location in Manhattan next week. Or maybe it's his sixth location. It kind of depends on how you look at it. The new restaurant is at 459 Lexington Avenue. That's the northwest corner of Lexington and 45th. “We're aiming to open early next week,” Kenny said. That's when the butcher paper you see in the picture will come off of the windows. He already has one brick-and-mortar store on 23rd Street, between Fifth and Sixth avenues, and he also has a fleet of four food trucks. It was what he learned from his food trucks that told him where to open his next restaurant. Kenny’s optimistic about the restaurant’s prospects. “We think it’s going to be fantasmo,” he said. That would be an improvement over the last store he opened, on Eighth Street, near NYU. It failed to thrive and closed after the economy went south. 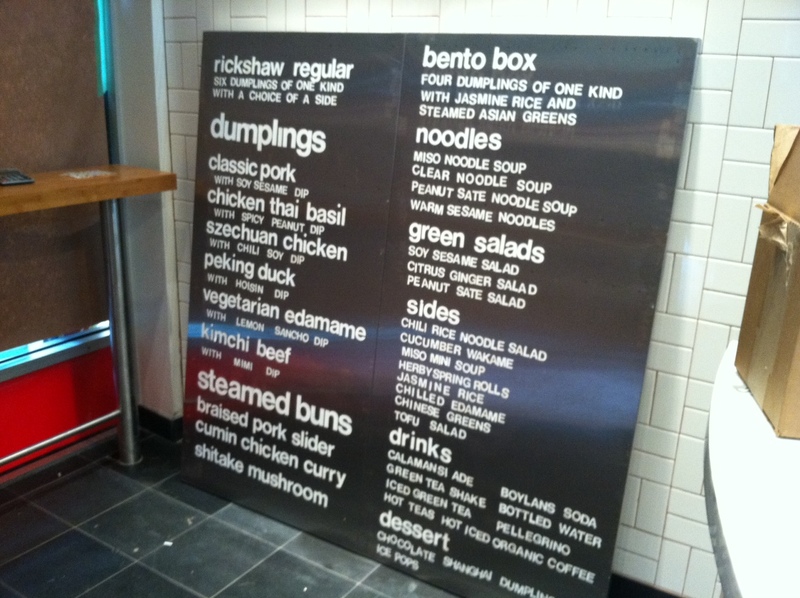 The health inspector has been by, the permits are in place, but Kenny’s still trying to figure out his new magnetic menu board, which you can see in the picture. He says keeping all of those letters in a straight line is a lot harder than it looks. 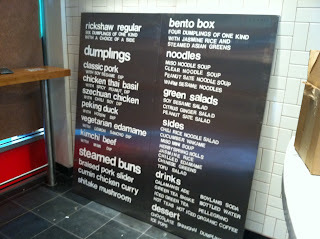 The denizens of Midtown East have gotten familiar with Rickshaw's classic pork, chicken Thai basil and edamame dumplings, but at the new shop they’ll have the whole gamut to choose from, including Peking duck, kimchi beef, Szechuan chicken, and mustard green veggie dumplings, along with steamed buns, three salads instead of the single one that's available at the trucks, a bunch of sides and four different noodle soups. Some new items are being added with the new opening, too, including warm sesame noodles. He’s also adding a cucumber wakame salad and herbaceous Vietnamese spring rolls — not the fried kind, the other kind — with a peanut dipping sauce.